Fotoforms originally known as Fun Shots was the first company offering laser-cut family photos through film processors throughout the United States. We just got the puzzle! Everyone LOVES how it looks. Thank you so much again for pushing this order through. It looks really good. We love our fotoform! Thanks so much! Nick and Chelsea, the engaged couple, will love it! I received my cut out last night and love it. Awesome job! You have a new customer and I will be sure to pass on your company to others. Thank you. Quick email here to say thanks for the great magnetic puzzles and timely delivery. We just received the puzzle. Wow, it looks great! Just awesome! Everything worked out perfectly. Just letting you know the puzzle arrived and it looks FANTASTIC! Guy, the puzzle arrived yesterday and looks amazing! Thank you so much. I'm sure it's going to be a huge hit! I want to thank you for all your help with our puzzle. It was a huge success and our team is still talking about it. We couldn’t be happier with the product and the service we received. Thank you for the great service and product. We received it in time. It was beautiful and we had a great Bar Mitzvah. Thank you for the amazing 20x30” cutout. I sent in a very low quality image and received an outstanding statuette! He can’t get over it & people can’t stop talking about it. Thanks again! I ordered a 16x20 shaped picture of her when she was a baby for her Sweet Sixteen party I just wanted to let you all know that it is absolutely breathtaking. I thank you so much for doing a wonderful job can’t waot to show it off at the party. Just wanted to share some images of the client putting together the puzzle. They were super engaged with the process and are really happy with the result. Received our fotoform and just LOVE it. Wish we had ordered more! We will definitely use your services in the future. Thanks for a great product! The package came today and look amazing. I love them. Thank you so much! Happy holidays! I love everything you have ever made for me. Thank you again!! Received my item today. I am very impressed with the quality! I look forward to using your company again! I just wanted to say THANK YOU for such an amazing cut out sculpture of Lynda Carter. It’s amazing! I will be ordering more in the future. I wanted to let you know our Fotoforms arrived and they were wonderful! One of the biggest hits of the party. Many people asked for your info so hoping you will see some more orders coming your way. I know I will be ordering soon! Thanks again for making it so easy. I just wanted to take the opportunity to thank you and your team again for your part in a successful event. The puzzle looked amazing and it was the center piece of several conversations during the Leadership Conference. So thank you again! The puzzle is absolutely amazing. It far exceeded my expectations on quality and ya’ll were a joy to work with. Thank you!! I just wanted to let you know that I received the puzzle today and it looks great! I will recommend your company for future projects. Thank you! We opened them up today and all my girls were so happy with them! Just wanted to let you know how wonderful my photo cutouts were. You have made the pics of my granddaughter come to life. Your work is excellent and I will highly recommend you. Thank you so much. Will order again soon. Just wanted to let you know I truly appreciated your extra effort to produce an awesome figure that I can have for a life time. Workmanship and quality is outstanding. Thanks again and I'm sure I will have more pictures that I will want to preserve. You have a satisfied and will be a returned customer. Just received my order and I love it! Can I get another just like it? I received the puzzle and I will say it looks great. Thank you so much. This will be a great part of the wedding. Absolutely amazing job. The puzzles are great!!! We put them together and are very happy with the construction. I’m so glad we decided to purchase from your company. A very grateful costumer, Thank you for the quick and quality work. Your work is beautifully done, came quickly and is highly recommended! Our family shared laughter and tears over our photo cutout! It was the last picture of our family together before our mother passed away. What memories and joy this cutout will bring to us in the future! I bought four of them, all at once, taking a chance on their quality, and am very pleasd at the laser cut and acrylic work. I have passed your name on to many people all ready! Thank you Fotoforms! Guy - I got the puzzle today and it looks fantastic! It is exactly what I needed for my activity. I received the Fotoform today, and it's amazing!! My husband is with the Astros' organization (hence the kids rockin' the jerseys) and this will be the perfect Father's Day gift...perfect for his desk. Thank you so much for such creating a one of kind gift. We have the puzzle in hand and it is fantastic! The entire team is very pleased, so much so we think there may be a demand from staff to purchase a copy for themselves. Just wanted you to know that I received the photo cut out from our wedding and absolutely loved it. It is perfect. We are having a 50th Wedding Anniversary Party and it will be on our cake. Thanks so much. We just received the magnetic puzzles and they look awesome!! Thank you for your work on this. My sales team is very happy and I’m sure they’ll make a great impression on our clients as well. We just received the first batch of puzzles, they look awesome! Thank you so much. Thank you very much. It arrived and it's BEAUTIFUL!! We are so happy with the results. Thank you for making this happen!! We will use your services in the future. The Fotoform turned out great, and thank you for the quick service! We received our puzzles today and once again are thrilled with the finished product. They are very sturdy and we love the finish on it. The easel on the back is perfect for what we wanted. Thanks for all your assistance on this project. Another fabulous job! Thank you!!! Love these cutouts! OMG they just arrived and are so perfect !!!! Thanks so much. You will most likely have three new customers after they receive this gift tomorrow ! THANK YOU so much. You sure don't find this type of service many places. I really appreciate it. I got my order today and love, love, love them! I'm thrilled to see these all came out awesome, thank you! Fotoform Cutout arrived. Thank you! Great job. Looks perfect! It's so adorable I needed one for myself, too:-). Thanks for doing such a great job. Love your company. I go to it for all my gift-giving needs! Thank you so much! You’ve been such a pleasure to work with and we’ve had great feedback on the teambuilding puzzles. Your team did a fantastic job! Just dropping a note to say thank you for the wonderful puzzle. It was very nice, very professional! Thank you for your prompt customer service, it was much appreciated. We love the puzzle. It is perfect, just what we wanted.! Thank you so much for the wonderful job you did on our coastal city puzzle. It arrived yesterday and looks amazing! The colors are so vibrant and it really pops when you enter the exhibit. I appreciate all the time you took to make sure it was perfect! Thank you so much for the amazing puzzles! The quality is impressive; they look great. I just received my cutout on base and it is amazing! I will definitely be using you again. Already have friends who also took your info. I have been disappointed by many online vendors that I was hesitant to order from you but so glad I did. Thank you! I received the magnets and they are absolutely perfect! They will make a perfect gift for my son. You created a couple puzzles for us last year and they have been great! They held up to a lot of wear and tear and still look fantastic. I just wanted to let you know that the puzzles have arrived and they look fantastic. Will look to work with Fotoforms again in the future. Got the puzzle today - THANK YOU!! It is perfect!! The bride-to-be is going to love it! These pictures (Fotoforms) make great thank you presents. Thank you!! We use your service every year for our girls activities. They love having the statues all around their rooms. I have used other places in the past and have found you to be the highest quality! I love your product. It makes a very unique gift and I enjoy giving that to family and friends. Have a great day!!! I received my fotoform today and it looks awesome. Can't wait to display it at my wedding next weekend. Thanks so much for your patience and guidance. And for the quick turnaround! I received the Fotoform, it's perfect, and it is now winging its way south to Texas. I will definitely use your company again and recommend you any chance I get! I received my package today. THANK YOU!!!! they are perfect. Just received my box of awesome Fotoforms and they look so good! So clear and quality from the pictures, you perfectly transformed into “form.” Thank you so much for such great service. My son is a sophomore so I hope to do this through his senior year ! I will be promoting your business believe me! My cutout arrived yesterday. It is spectacular! I couldn't have hoped for more. Can't wait to top the cake with it. Many thanks for a beautiful product. The Fotoforms arrived today and they are absolutely fantastic!! I love them and I know they will be a big hit at my kids' school! I will definitely be ordering from you again. Thank you so much! We received the puzzle today. It is wonderful! We just love it; the quality and color is perfect! Thank you so very much. I just received my order. I couldn't be happier! My friend just lost her parents and this will touch her heart! Thank you. Just received my order. Really looks nice! Exceeded my expectations. Thanks. I received the plaques (sports awards) today and opened one. They look great!!! Thank you so much!! I would like to reorder the magnetic puzzle I did last year with this new image. The one you did last year was fantastic! The puzzles look great and will work wonderfully! Thanks! WOW!!!! What a GREAT place to work with !!!! The cutouts arrived and are even beyond my expectations!!! Thank you SO much!! Just wanted to tell you I recently received my order with a second on the way and I was just so pleased with the way it turned out. you did a great job. love it !!!! going thru more pictures I will want to have done. Thank You. Great Service and great job. Thanks and Merry Christmas! The puzzle is awesome! Thanks for all your hard work. I just received the photo statues I ordered from you and they are wonderful! I've always ordered from another company, but from now on, I'll order from you! And you even contacted me to ask me a question on how I wanted you to do them which was extremely nice! Thank you so much! They turned out great! Love your products….I used someone else in the past and was very disappointed! Thank you!! The Volleyball girls look Fabulous!! Big smile here. Thank you for getting it to me so quickly :) I will refer your company to everyone I know. This product is outstanding! Thank you very much! Your product was better than I even thought it would be! It is a cake topper for my only son's wedding cake. Great job! I will be updating Facebook with a photo a rave reviews following the event. I wanted to tell you that I LOVED your puzzle you did for Thrill o the Hunt. My client LOVED them! The pieces were very professionally done and packaged! I will be using your services in the future. All the items are just great! So meaningful. Alive. Perfect! Done with care and perfection!!! Hey Guy, my order arrived safe and sound today and I love what you've produced! Many many thanks, you've made my day! We received our puzzle yesterday and just wanted to let you know that we were thrilled with it! It was everything and MORE that we had hoped it would be. I got my cutout and it is PERFECT!! Thanks for the great and fast work. The pieces are amazing - bigger and stronger than I imagined, very clean and cleqr as you described. Excited to see the action of the teams. Absolutely amazing . . . great work. Can’t wait to put them together tomorrow evening. I received the product and it is excellent!! I have 3 others from different companies and yours is the best. Thank you very much... I will be sending additional orders your way. They look great! We will have the puzzles set up at the Ohio State Fair next week. We are so happy with the quality of your product, we decided to order one for everyone in our company! Thanks for the amazing cut-outs. They mean the world to our anniversary guys. Got the package today. Wow, this is the real deal. Beautiful, professional work. I am extremely happy. My cousin is going to cry when she sees this. Thank you for your quick response to my questions and the fast turnaround. Thank you so much! It (24 x 48 inch, 96 piece custom puzzle) looks fantastic! Receipts order! It's absolutely wonderful!!!! Thx u! I just wanted to say “Thank you, thank you, thank you!! !” The puzzle was amazing and everyone, especially my daughter, loved it. I will recommend you to everyone. You were wonderful to work with, and you made the entire process go very smoothly. I got it and love it! Thank you!!!! (It was my Grandmother doing the hula). I just received all of the cutouts. They are really great, fantastic! My Boss loves them. You all did such a great job! We received the 2nd set of puzzles today, you guys did a most outstanding job, thanks again for all your help. Thank you. You did an amazing job. Love the photo cut out. Got the Georgia puzzles today and they look spectacular, thanks for all your assistance in making this happen for us. I just got the Bat Mitzvah puzzle and I can't even thank you enough, it's so awesome! I love the puzzle and could not even picture it to be such great quality!!!! Excellent job and service!!!!!!! I just wanted to say that the Fotoform turned out perfect! Thank you for the quality work! The puzzles are fantastic!! Thank you so much for doing a great job on them, I really appreciate it! I got it today and its amazing!!!! Spectacular! LOVE LOVE LOVE the two Fotoforms I ordered. You did a terrific job. Thank you!! My 1st order exceeded my expectations. I got a chance to see the Fotoform when I visited my friend Mark who I had it delivered to – excellent job. Got the order today and am thrilled it's here to give for Christmas! You do an awesome job! Our order arrived yesterday. The work is great. Well done. We will definitely order from FotoForms in the future. Service was great throughout the process. The website is well designed and easy to navigate. I received my two puzzles and once again you guys did an awesome job! The puzzle was a great detail of our party! People really liked it! We gave the puzzle pieces out let people put their initials or first name on it and then place it on the right spot. I absolutely loved the results. I will post my comments on facebook. Your Cutouts are a thousand times better than the ones we bought from a different company! I just wanted to say thank you for such a great product. It turned out PERFECT! People have loved the cutout of the three monks! I put one in a Nepal Health Clinic fundraising silent auction - and high bid was for $250! Thank you for the statues! They arrived so quickly and look fantastic! The form came back yesterday and it's so cute. Thank you. I GOT MY TWO FOTO FORMS FRIDAY. MAN THEY LOOK GREAT! I received the Fotoforms of the senior Siena girls today. Absolutely wonderful! I can't stop looking at them. The girls are going to be so surprised. My eyes just opened to a whole new world of gift giving! I got it, checked it out, it’s here on time, and looks great. I’m glad I put my faith in you instead of the other companies. Thank you! I just want to thank you so very, very much for your wonderful cake top (Fotoform Cutout). It came out exactly as we wanted, and we are grateful that it was so easy to work with you, and that you got it done so fast. Its perfect!!! I LOVE IT!!!!!!!!!!!!!! !Thank you so much!!!!!!!!!!!!!! I received the Fotoforms and love them! Thank you so much. I will definitely be ordering more. The cut outs are wonderful! I will be ordering more in the future. Thank you for doing such a good job. Thank You for the fantastic job you did on the John Wilkes Booth cut-out. I just wanted to thank you again for your fine work and prompt delivery. My friend was THRILLED when she received her birthday present today of her two daughters. We have received all the cutouts and they are all great! You do such wonderful work. Our clients LOVE the cutouts. It is a joy using you because you make everything so simple! Hey, there. Just letting you know I love it!! Thanks again. The puzzle came out amazing!! I am so happy with how it turned out and I am even more excited to use it at Orientation this afternoon! Thank you for all your help. Take care. Hi Guy, my daughter’s bat mitzvah was last weekend and I just want to let you know the puzzle was a huge hit. It turned out beautifully and those that were honored with a “piece” had fun putting it on the board. Thank you for such quality work. It was a pleasure working with you. You guys created some awesome Acrylic X display pieces for us back in December and we are interested in getting a quote for a few more. THAT IS ONE AWESOME PUZZLE! Thanks Guy for your help! Thanks so much. We love your products and look forward to ordering them for our senior Baseball players each year. I just got my order and I LOVE it. It was just what I wanted and just what you advertised. Thank you and I WILL order again. FYI - got them and they look great! Especially the last one - the 8x10 airborne shot of him! Thanks! Hi Guy, I just received the first batch of Fotoforms. They are, well in a word, Fabulous! Great Job! Thanks again. You customer service has impressed me! I was so pleased with the puzzle! The puzzle is beautiful!! Everyone spoke highly of it. The Guests had fun putting it together before us and we had fun watching them. When it was placed in the frame everyone smiled. I wanted you to know that I thoroughly appreciate the extra effort you made to make the puzzle and the frame. Hopefully this will go down in history for you. It was the first and most unique guest book anyone has seen and the first puzzle in acrylic. Guy - they look awesome!!!! Thx again. Guy, the FotoForm just arrived and it is just wonderful! I could not be happier. There will have to be many more of your products for my family in the future. Thanks again for the fast service and beautiful work! Thanks, Guy! I got the puzzle late yesterday. It looks WONDERFUL! Thank you very much!!! Thank thank you thank you! My mother loved the Fotoform of her grandkids! It arrived earlier than expected!! I will definitely use your services again! The Sales awards were big hit – they look fabulous! Everyone was very pleased. Thank you! The puzzle made a wonderful debut at our Global Conference in December. We were so busy in December I forgot to let you know. We loved them! They were exactly what we were imagining. Thank you for all of your work! Just wanted u to know we received our Fotoform Thanks sooo much!!! We luv it. Hiiiii!!! I just wanted to tell you that I got the package and I LOVE LOVE LOVE ITTTT!!! Thanks again! I received the item yesterday and I am truly impressed with the quality of your work. My first reaction was "Wow!" 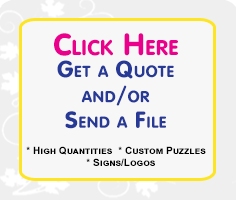 I will recommend your site to family and friends and I look forward to ordering additional items in the future. I received my order today and I couldn't be happier. I will definitely order again as well as make sure everyone knows where I had the photo done. Thank you so much! God bless and have a Merry Christmas. I received my order and love it! I should have ordered 8x10, so I'm ordering another one today for 8x10 of the same print. Thanks! I received the cut-outs. THEY ARE FABULOUS. Please thank your staff that worked on my order. I really appreciate the time-consuming, attention-to-detail effort it takes to do these. You did an excellent job on the fotoforms that we ordered. We just loved them and appreciate how well you cut around all the details. The party that we used them for was yesterday and people--especially the birthday boy--thought they were great. Thanks again! I received the latest Fotoforms and they are terrific! I am also going to be sending you 2 more pictures of a dog. Thank you! Fabulous job on the photos. My friends were very pleased with their gifts. I was very impressed with the speed. Thank You! I got to tell you I just love these Cutouts I wish I would have gone bigger but I do love it. Thanks for the fast turn around. The puzzles were amazing, thanks again for working with us and getting these done in a timely matter. Just want to drop a quick note to let you know that I received the photo sculpture and it is beautiful. I love it! I showed it to one of my co workers and she started to cry when she saw it, she said it is just so beautiful.... Great job done and thanks a lot! I just wanted to extend my appreciation to you for exceeding my expectations. The Cut-Outs came out so beautifully and the quality is amazing. I cried when I first unwrapped them. I know my brother and his family will cherish them for ever! My Fotoform arrived today. Wow not only does it look fantastic, but it arrived very very quickly. I had a cut out done (by another company) of this same grouping about six years ago and 16 years ago. Your technology is much better! Thanks so much. Nice work! I just got my order with my two football playing boys! I absolutely positively LOVE them and I know they will, too. Thanks for the excellent suggestions and work and quick turnaround on my order! Just got your package. They look incredible. THANK YOU so much. They will be very happy. We will keep you in mind for other projects. Yes, I have thought about how well this past dance season has gone, our customers were very happy with this product, and I really don't think the production side could have gone much smoother...finally! I am absolutely going to put in many good words about your company and working with you and your staff. I'd like to introduce Guy Hamilton to you. You are probably familiar with Fotoforms, the plastic cutouts. I have been doing business with Fotoforms for thirteen years. They are one of our favorite vendors, and their products are customer favorites. 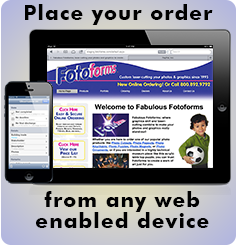 There are probably many IPI members who already buy from Fotoforms. I know Dan's Camera City uses them, and Bob Banasek did up until he closed his store. As many members are taking a page from Phil Gresham's book and looking to expand their gift offerings, I think Fotoforms are a good fit.